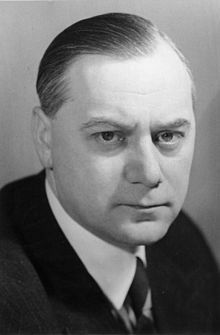 Citation: C N Trueman "Positive Christianity"
Positive Christianity was a religious philosophy supported by Alfred Rosenberg, the man seen as being the intellectual heavyweight of the Nazi Party. Positive Christianity had existed prior to the rise of the Nazi Party but Rosenberg believed that the party should adopt it as the religious way ahead. The party did adopt it in 1920 in its ‘25 Point Programme’. However, Rosenberg never clearly explained what he meant by Positive Christianity as his ‘version’ differed from the accepted historic version. One of Adolf Hitler’s main criticisms of Rosenberg was that he was never particularly clear as to what he believed, or that he was unable to put his ideas into terms that the less intellectual could understand. However, it seems that in his version Rosenberg wanted the complete rejection of Catholicism and Protestantism. Rosenberg saw Positive Christianity as a way of purifying the German Nordic race and to harmonise the belief in Christ with “the laws of blood and soil”. Combined with this, Rosenberg saw the way ahead as restoring the old pagan Nordic values and “substitute the spirit of the hero for that of the Crucifixion”. Positive Christianity also rejected what it called “Jewish materialism”, which gave an obvious anti-Semiteslant to it. Rosenberg believed that Christ had actively fought against the “institutionalised Judaism” of the day and that this alone was enough to support why Positive Christianity should be anti-Semite. Rosenberg believed that Christ was an Aryan hero. Rosenberg saw Positive Christianity as Norse paganism being at one with Christianity. Rather than have the cross as the symbol of Positive Christianity, Rosenberg wanted the sun in the form of a sun cross. Hitler never gave his public approval to Positive Christianity but he was sympathetic towards it and gave Rosenberg his private support. While the concept had been accepted into the Nazi Party’s official party doctrine in 1920, Rosenberg spent a number of years developing what he felt was an appropriate version for Nazi Germany which he explained in his book “The Myth of the Twentieth Century”. After Hitler became Chancellor in January 1933, Rosenberg could put into practice what he believed in. In 1934 the German Faith Movement started led by Jakob Hauer, which emphasised the beliefs of Positive Christianity. Hauer wanted to ban prayers being said in schools along with nativity plays. To what extent Positive Christianity was important in Nazi Germany is difficult to know. It is known that Rosenberg was not the most influential of the senior Nazis within the regime. It is also known that Hitler wanted the whole nation to follow a path of coordination (Gleichschaltung) and within the sphere of religion this was within the Reich Church or German Evangelical Church initially led by Reich Bishop Ludwig Műller. However, the extent of the influence of the Reich Church is open to question as many pastors objected to it. Hitler never pushed hard for the Reich Church to succeed and he viewed rebel pastors such as Martin Niemőller primarily as ‘enemies of the state’ as opposed to a religious threat.